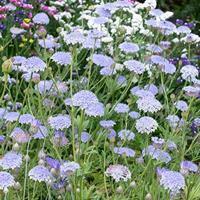 Lavender blue, flat flower heads resemble Queen Anne's lace, and the frothy flowers and curving stems with fine, deeply lobed leaves are graceful additions to the late summer and fall garden. Introduced from Australia in 1828. Introduced from Australia in 1828. Lavender blue, flat flower heads resemble Queen Anne's lace, and the frothy flowers and curving stems with fine, deeply lobed leaves are graceful additions to the late summer and fall garden. This little known species is a gem. It blooms continuously until temperatures dip to freezing, developing purple tinged stems in cooler weather that look fantastic with the eyed flowers of lavender and cream. 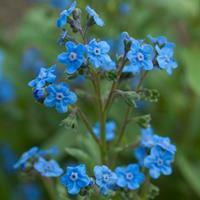 Dripping with cottage garden charm, we wouldn't be without this graceful wildling. Cuttings over winter on the cool windowsill quite well. Aptly named ‘Marvelette’ won a Fleuroselect Gold Medal for it is such an improvement over the species. 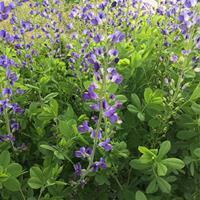 A compact perennial that blooms the first year from seed, it sports large flowers on upright wands that are clustered together in a cloud of bloom. 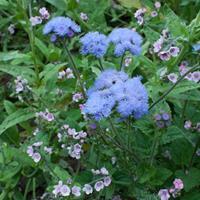 Minty scented foliage repels pests while bees and butterflies are drawn to it. True blue as can be, these double flowers with violet centers are covered with busy bees all summer. Cheerful blooms all season long in moderate summer areas, no fussing over needed! Easy to grow and wonderful cut. 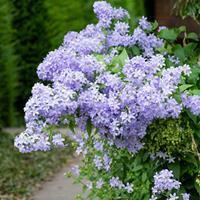 'Blue Diadem' is a tall variety with extra large flowers, introduced around the 1970s. 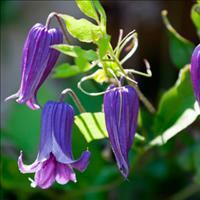 This species, with its vivid blue petals brushed with violet, has added advantages over modern types. Only in windy sites do they need staking, and they are quite hardy, lasting in my garden for years. Combine with lilies, phlox and roses for an old-fashioned romantic garden. Listed in a 1912 American seed catalog. Sutton's 1934 catalog lists 'Sutton's Seedling Belladonna,' a new seed variety described as pale blue. 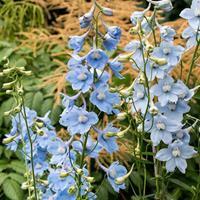 'Cliveden Beauty' is a similar named heirloom that carries graceful sprays of sky-blue spikes in early summer. Gorgeous with pastel hollyhocks or apricot foxgloves. May rebloom in fall if cut back.